With Kevin Rudd’s return to the Prime Ministers’ Office, there’s been a whole raft of questions that have arisen about the state of the Federal wing of the Australian Labour Party. From Jessica Rudd raising the heckles of a lot of members of both the Public Service and the Press Gallery within Parliament House through to resignations galore from the likes of Emerson, Conroy, Swan and Garrett amongst others, some of these questions have been overt, while others have been a bit harder for people to find. Take the glaring rental-income time-bomb that’s been lurking in the shadows of Mr Rudd’s Pecuniary Interests for the past three years, for example. As some of you would be aware, The Rudds own a property near Noosa called “Ocean Blue”, while according to the Pecuniary Interests Register, Mr Rudd himself owns a $2.25million mansion at 35 Mueller Street in Yarralumla, which is one of the priciest suburbs to be found in Canberra. Needless to say these properties command a hefty rental pricetag, with “Ocean Blue” setting potential holiday goers back a cool $6800 a week throughout the peak summer holiday period, via Zinc Properties Noosa. While 35 Mueller Street’s rental income is undisclosed, it has been stated by The Canberra Times that the property was rented out between late 2011 and mid June 2013. Given the characteristics of this property, as well as the rental prices for comparible homes within Yarralumla, it wouldn’t be unreasonable for the rent to have been over $1300 a week throughout this period. Needless to say, even if the “Ocean Blue” property was only rented out for three weeks a year during the peak holiday period and the Yarralumla property for $1300 a week over an 18 month period, that’s a substantial level of income which has quietly been entering the coffers of the Rudd household over the course of the 43rd Parliament. 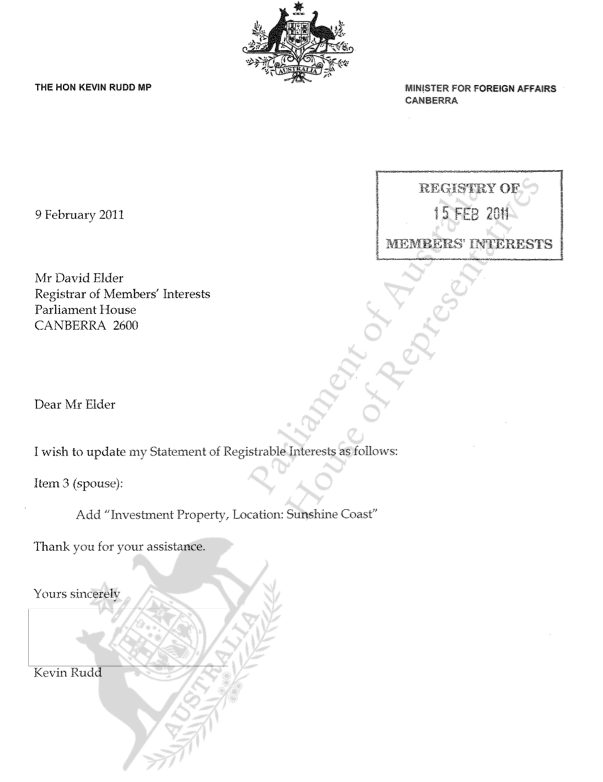 Why didn’t Prime Minister Rudd disclose the fact that he and his family have received substantial levels of income via rental proceeds from these properties since their purchase nearly three years ago, as required by Section 10 of the Pecuniary Interests Register, on top of the registration of ownership of said properties in Section 3? This is even more perplexing when you take into consideration that under the requirements for Section 10 simply stating “I am receiving a rental income from these properties”, would’ve sufficed for the purposes of the Parliament. While the exact location of investment properties isn’t required as a part of the Pecuniary Interests register, the fact that such properties can bring in substantial levels of various types of regular income is of interest to the Parliament, given standing House and Senate resolutions that focus on that particular topic. That’s because the source of said income can cause conflicts of interest from time to time for politicians, during the general work of Parliament. Furthermore, Mr Rudd has listed smaller sources of additional income throughout the 43rd Parliament, such as copyright allocation payments for articles that were published within “The Monthly” in 2009. To even further disturb the sentiment in the bottom of the fish-tank, a quick peruse of the loans listed within the same Pecuniary Interests submission as Mr Rudd’s Yarralumla property raises even further questions. Namely, why did Therese Rein take out multiple loans in 2010, what sort of loans were they and why is Mr Rudd listed as a “Guarantor” for both loans, given Ms. Rein’s personal wealth of over $A200 million as of mid 2012. Given that the name of the lender for the second loan wasn’t provided and that politicians have been targeted for paying their spouses rent on properties within Canberra in the past, this is also a question that needs pursuing. Needless to say, this isn’t the first time that a politician has had problems with their Pecuniary Interests and nor will it be the last. However given Prime Minister Rudd’s political ambitions throughout his career, it is deeply surprising that both he and his staff have allowed such an omission to go overlooked as long as these particular substantial income streams and loan have. That’s predominantly because most politicians often take great delight in whacking both their “friends” and enemies alike with inconsistent and peculiar information from their Pecuniary Interests, especially given how accessible the Pecuniary Interest Registers for the Federal House of Representatives and Senate are today. Over the past fortnight the Prime Minister’s office has been asked for comment via both phone and email on five different occasions in regards to this story, though hadn’t responded to the aforementioned media requests as of the deadline for this article tonight. 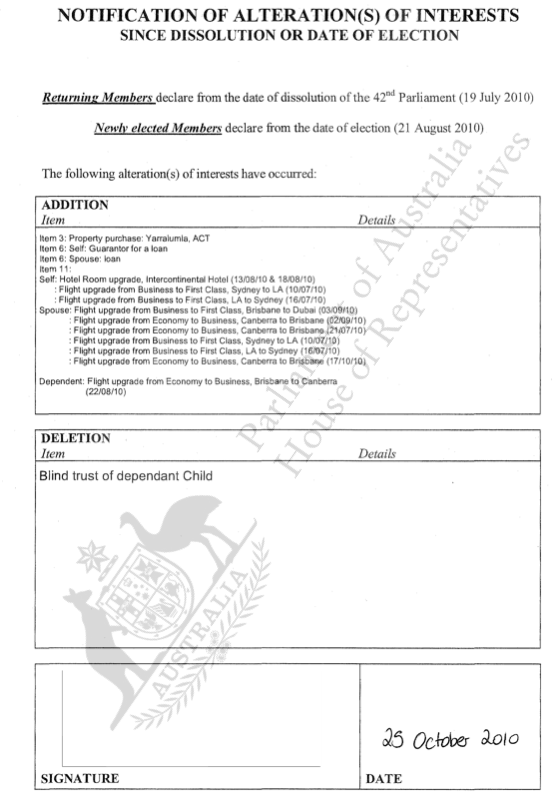 For Prime Minister Rudd’s most current Pecuniary Interests register entry, check out the Scribd PDF below or the Members Interests section of the House of Represenatives side of the Australian Parliament House website. More concerned about Tony Abbott’s recently exposed (and lied about by him) lack of disclosure of about $10k of expenses for promoting his book – not to mention the time government funded staff spent on this private enterprise. Then there’s tens of thousands of dollars he has been reimbursed for “charity” trips – some he chartered a plane for (meaning more was spent on the flight than to employ someone to do the job for months). Plus he’s always claiming the away from home allowance for such things. Then there’s the $700K loan he didn’t bother declaring for some time. Might have been years?